With its beautiful, weeping branches and diamond-shaped brilliant green leaves, which turn yellow in autumn, Youngs weeping birch tree is undoubtedly bound to be a focus of attraction in any garden. In spring its fluffy, yellowy-brown catkins are of additional interest. This low, dome shaped tree has a stripping white trunk which adds year round interest to any garden. 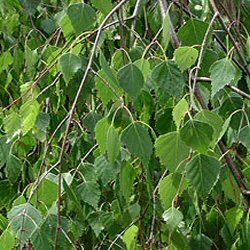 This tree is supplied at a height of 1.5 to 2.2 metres in a 12 litre container for year round planting and better results than from bare-root stock. Expect a final height of 9m (30ft).